A Supreme Judicial Council spokesman said the court believed Kosrat Rasul's remarks were an incitement to violence. He made them in a statement condemning the withdrawal of Peshmerga fighters from Kirkuk and other disputed areas. Baghdad launched an operation to retake them on Monday, three weeks after the Kurds held an independence referendum. People living in areas under Kurdish control overwhelmingly backed secession but Iraqi Prime Minister Haider al-Abadi declared the vote illegal. 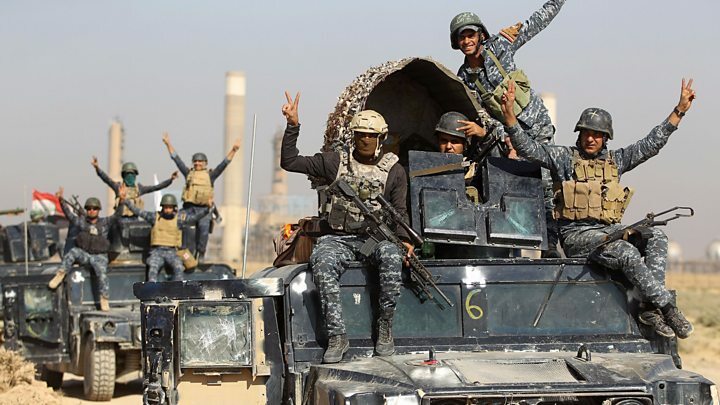 On Tuesday night, after the military operation concluded, Mr Abadi said the referendum was "a thing of the past" and offered "dialogue under the constitution". Kirkuk is an oil-rich province claimed by both the Kurds and the central government. It is thought to have a Kurdish majority but its provincial capital has large Arab and Turkmen populations. Kurdish Peshmerga forces took control of much of the province in 2014, when Islamic State (IS) militants swept across northern Iraq and the army collapsed. Mr Rasul issued a statement on Wednesday that criticised his own Patriotic Union of Kurdistan party amid reports that other leaders had ordered Peshmerga under their control not to resist the Iraqi troops as they advanced into Kirkuk. There was only one serious clash on the outskirts of the city on Monday, which is reported to have left between three and 11 combatants dead. Mr Rasul said the territorial losses represented a "new Anfal for Kurdistan" - a reference to the campaign of genocide against Iraqi Kurds by Saddam Hussein's regime in 1987 and 1988. On Thursday, a spokesman for the Supreme Judicial Council said a court in Baghdad had issued an arrest warrant for Mr Rasul in connection with the statement. "The court considers these comments as provocation against the armed forces, under Article 226 of the penal code," the spokesman added. The offence can carry a jail term of up to seven years or a fine. It is not clear if Iraqi security forces will attempt to act on the warrant because they do not operate inside the Kurdistan Region. However, the warrant could prevent Mr Rasul leaving the country.